Theory – History about the origins of the pizza and discussion about the choice of products used to make the Neapolitan pizza and also about the tools used to make the pizza such as the Wood burning Stove. You will also learn about hygiene and health and safety in a professional kitchen. School – You are going to spend lots of time working and preparing the dough, forming the balls, cooking pizzas and preparing the ingredients. 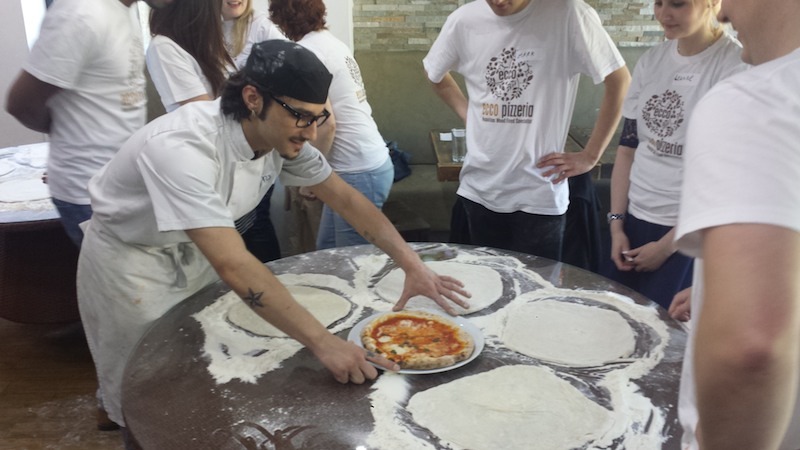 You will learn tips and tricks from out Master chefs so that you are successful in making authentic pizzas. Professional Stage – You will observe our professional chefs and will also demonstrate your skills by helping during service in the restaurant. Exam – You will complete an exam on Friday afternoon. Once passed you will receive a certificate saying you have competed the course successfully. Duration – The course will take place on the first week. It will be carried out once every 3 months; dates to be confirmed. The course will take place from Monday to Friday. Hours will be 10am until 3pm. Then in the evening from 5pm until 11pm. Location – The course will take place in our restaurant in Headingley. Work Uniform – A work uniform will be provided by us.